Configurable to 2.3GHz quad-core Intel Core i7 (Turbo Boost up to 3.5GHz) with 6MB shared L3 cache or 2.6GHz quad-core Intel Core i7 (Turbo Boost up to 3.8GHz) with 6MB shared L3 cache. Configurable to 2.6GHz quad-core Intel Core i7 (Turbo Boost up to 3.8GHz) with 6MB shared L3 cache. Configurable to 512GB or 1TB flash storage. Configurable to 1TB flash storage. Your MacBook Pro with Retina display comes with 90 days of free telephone support and a one-year limited warranty. Purchase the AppleCare Protection Plan to extend your service and support to three years from your computer’s purchase date. Only the AppleCare Protection Plan provides you with direct telephone support from Apple technical experts and the assurance that repairs will be handled by Apple‑authorized technicians using genuine Apple parts. For more information, visit Apple Support or call 800-823-2775. Requires Internet access. 802.11ac is based on an IEEE draft specification. 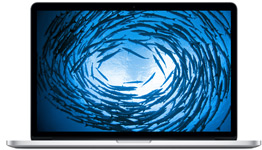 Testing conducted by Apple in October 2013 using preproduction 2.3GHz quad-core Intel Core i7–based 15‑inch MacBook Pro units, preproduction 2.0GHz quad-core Intel Core i7–based 15‑inch MacBook Pro units and preproduction 2.6GHz dual-core Intel Core i5–based 13‑inch MacBook Pro units. The wireless web test measures battery life by wirelessly browsing 25 popular websites with display brightness set to 12 clicks from bottom or 75%. The HD movie playback test measures battery life by playing back HD 720p content with display brightness set to 12 clicks from bottom or 75%. The standby test measures battery life by allowing a system, connected to a wireless network, to enter standby mode with Safari and Mail applications launched and all system settings left at default. Battery life varies by use and configuration. See www.apple.com/batteries for more information. Pages, Numbers, and Keynote are free on the Mac App Store for qualifying Mac computers purchased on or after October 1, 2013. OS X Mavericks required. Downloading apps requires an Apple ID. PVC-free AC power cord available in all regions except China, India, and South Korea. Jika anda merasakan artikel ini bagus dan boleh dikongsi dengan rakan anda, berkongsilah melalui facebook, e-mail atau twitter Percayalah jika anda memberi satu kebaikan kepada orang lain 10 kebaikan akan kembali kepada anda.